For many years, I’ve wanted a new garage. Our house is pretty nice. It’s not huge, but was remodeled before we purchased it, so it’s pretty modern in terms of good windows and insulation. However, the two-car detached garage had never been touched since it was originally built. And it wasn’t built well to start with. When we moved in, the garage concrete had many cracks in it. I could see daylight right through the siding. There was no sheathing on the walls, just siding over studs. Of course, there was zero insulation and electrical was only a single 15 amp circuit. Besides that, the eves were rotting out, and occasionally pieces of wood would simply fall off. My house has no basement, and is limited on storage space. One bedroom doesn’t even have a closet. So, since I needed to rebuild the garage anyways, I wanted to build it LARGER so that I would have some workshop and storage space. The main thing is to have a larger space for working on projects, fixing cars, and general storage and workshop. Of course, in my area, it’s just plain COLD all winter. I want insulation and heat in my garage. Since the new garage will be built from scratch, that also meant that I could reorient the roofline. The old garage roof ridge ran north and south, which makes the faces of the roof east and west. That’s not ideal for solar access. The new garage will have a steeper roof, facing due south. Not only is that ideal for solar, but a steeper roof also means that I can have an upstairs that’s tall enough for me to walk in. Besides being used as storage space, it opens up the possibility of use as a home-office, clubhouse, secret headquarters, etc. My property is very narrow and on a corner. Part of the reason that it’s so narrow is that way back when, a local road was turned into a State Road, and right of way simply ate away at the property. Also, for whatever reason, my front yard and back yard were on separate tax keys. I just got two tax bills every year, but the one for the back yard was cheap, so that was fine. The County put a whole pile of requirements on me to get a zoning permit. I had to combine tax keys, get a new deed to my property, and jump through a number of legal hoops. This took about a year and a half and over $2,000, just to get the zoning permit. I was also restricted in building height and the upstairs was not allowed to have any form or permanent staircase. In terms of physical restrictions, my property has a very strange water table and flow of water underground. That’s part of what caused the concrete of the original garage to break so badly. New concrete would have to be engineered to account for this. The new foundation would have to be much more like house foundations in my area, with a deep footing, several layers of concrete block, and reinforcing material in the concrete. That adds up to plenty of work and expense. Speaking of expense, the total estimate of the garage cost, is significantly higher than just a plain garage. We changed our mortgage, getting a new one which paid off the remainder of the old mortgage, giving us both a lower interest rate as well as cash out to pay for the garage construction costs. First of all, there are PLENTY of different ways to create a building – SIP, Strawbales, Advanced Framing, Steel, etc. etc. While there are advantages and disadvantages to each, it looked like “traditional” construction was the way to go on this project. My Dad and brother both have plenty of experience in typical residential remodeling construction. Wood framing is easy to do at a human scale. Wood and fiberglass are conveniently available at the local lumber yard and big box home improvement stores. 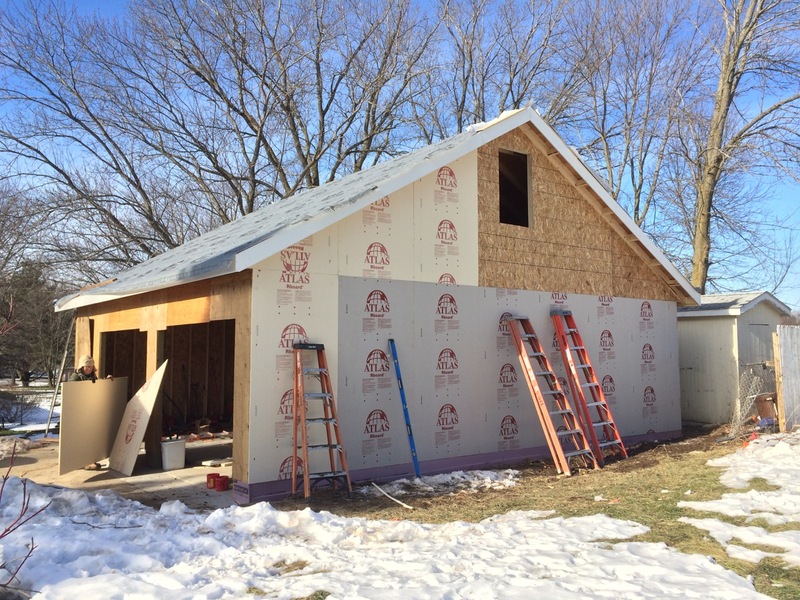 For the actual construction of the garage, we chose typical wood framing with an engineered truss roof and metal roofing. Insulation will be typical household style of my area, which is fiberglass, with some exterior foam under the siding. Metal roofing has an extremely long life-time, is fireproof, and is 100% recyclable. Standing seam metal roofing also allows the use of special clamps to attach to the roof WITHOUT penetrating the roofing materials. That’s perfect for installing solar panels with no chance for leaks! The roof of the garage is covered with 24 solar panels. Each panel is rated at 260 watts, for a total faceplate power of 6,240 watts. Each solar panel is connected directly to an Enphase M215 Microinverter. The inverter converts the DC power from the panel to AC power for the wiring. Because it’s all AC power, this simplifies the system, eliminates a DC disconnect, and makes it easier to wire up myself. The maximum power available through the inverters totals out to a peak of 5,400 watts. Our power bills right now average about 600 kWh per month, including all electricity for the house AND charging an electric car. According to my math and the average number of hours of good daylight in my area, 5,000 watts of solar should produce just about that much power per month. This should give us close to a NET ZERO AVERAGE ANNUAL electric use! The solar was officially fired up June 5, 2017. The first full month electric bill was a $40 credit, and the next month was a $20 credit. In the first year of production, we produced just shy of $1,000 worth of electricity. Out of pocket costs for the solar was $10,500. Costs AFTER incentives came to $6500. A simple economic return on investment should come to about 6.5 years. Checking at the very end of 2018, the garage was on track for that 6.5 year ROI, with only 5 more years to go. 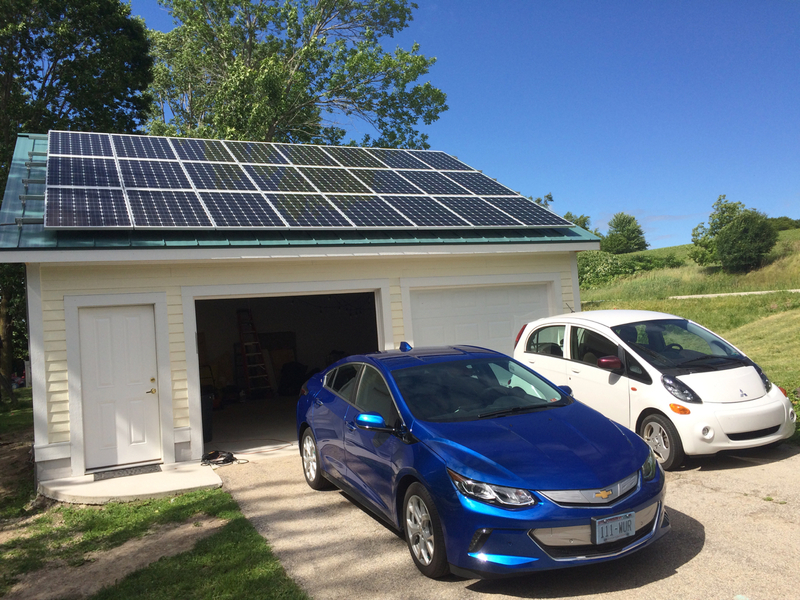 I have written a complete, step-by-step, write-up on how I did my Photovoltaic system and posted it at DIY SOLAR GARAGE on Instructables. The heat for the garage will be ELECTRIC. I know, I know…. “Electric isn’t an efficient way to heat!” – What people really mean is that it’s not as CHEAP as natural gas and some other fossil fuels. By using electric for heat, I won’t have to install a natural gas pipe to run from my house to the garage (which would be somewhat expensive/complicated.) Besides that, I’m trying to get AWAY from fossil fuels. For more information on this heating system, please read the installation manual for the heater. “Mini-Split” air-to-air heat pumps are also great devices, but are less efficient than geothermal, and have issues with diminishing efficiency and icing as the temperature drops. In my area, you NEED a backup heat source if you have a heat pump system. Because heat pumps are not common in my area, that also means there are few experienced and qualified installers. Another comment I’ve been getting a lot is that I should install flat-plate or vacuum solar collectors. These circulate antifreeze to collect heat from the sun, and then pump it to where you want it, usually for water heating, but it would also work great for a hydronic heated floor! That’s actually a GREAT idea, but it has two caveats. For one, you need the space for the solar collectors, and that space has to have good solar access – in the winter – when the sun is the lowest and the shadows are the longest. I would need quite a few of those solar panels to get enough heat for the garage. In the summer, those panels would do nothing for me, as I don’t need the heat! It would be a considerable investment in panels that would only work part of the year, and when I need the heat the most (winter, at night) that’s when the solar resource is least available. Secondly, those panels would only produce HEAT. The PV solar panels can produce heat, light, motion, whatever electricity can do for you. That’s useful power year-round! The garage was laid out with the main section of roof pointed DUE SOUTH. 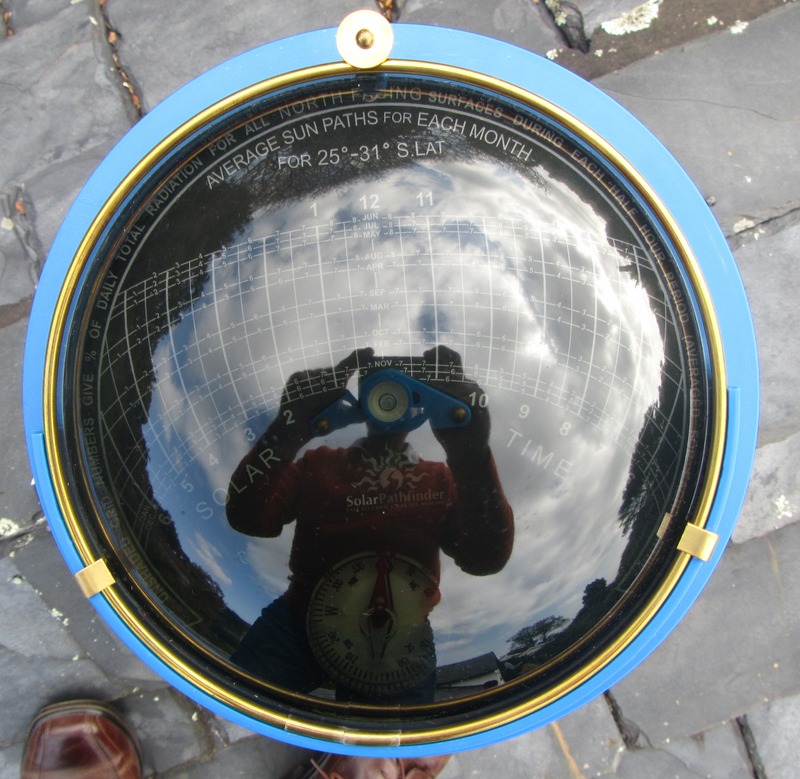 This is ideal for solar collection. The overhead garage doors are also on the south side. 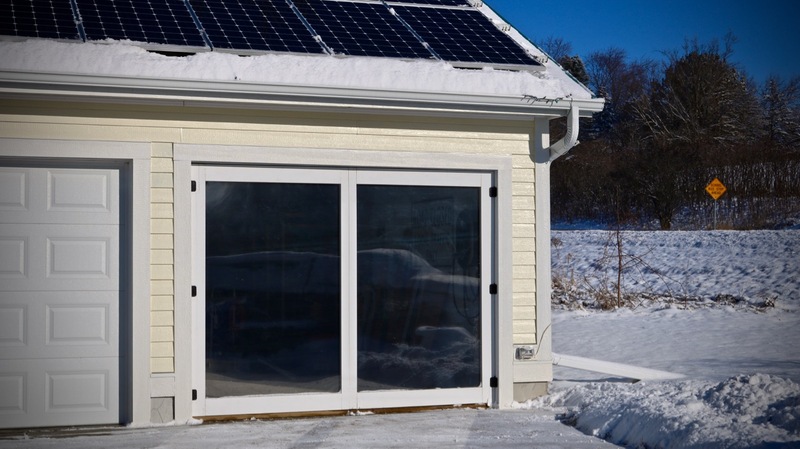 By using the garage doors not just to let in cars, but also to let in SUNLIGHT, the garage can be partly heated. Of course, there needs to be some sort of clear glazing to keep the heat from going right back out! There’s a great example of this over at Build it Solar. I built a wooden frame around two pieces of plexiglass which fit in the opening of the garage door. They completely cover and seal in the existing insulated overhead door. During a sunny day, I can raise the overhead door to let light in. At night and on cloudy days, I can lower the door to keep the heat in. The new “Passive Solar Doors” are hinged and can still open and close to allow for vehicles. For full details on that project, please see my write up on Instructables. 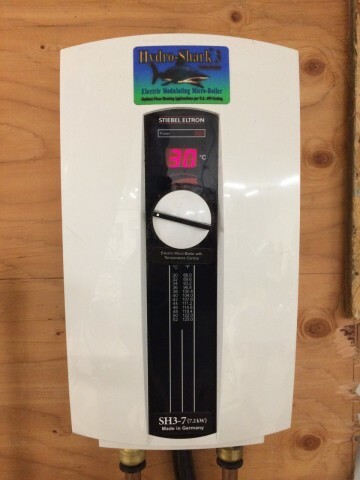 Is there some other way that I could get heat into my garage which I could COMBINE with hydronic in-floor heat? Sure. How about wood-fired heat!? I already checked with my insurance company, and they will NOT insure a garage with a woodburning stove in it. (The logic is that there is gasoline, etc., stored in a garage.) They DO already insure my house with a wood-burning stove in my living room, and they also will cover outdoor wood boilers. 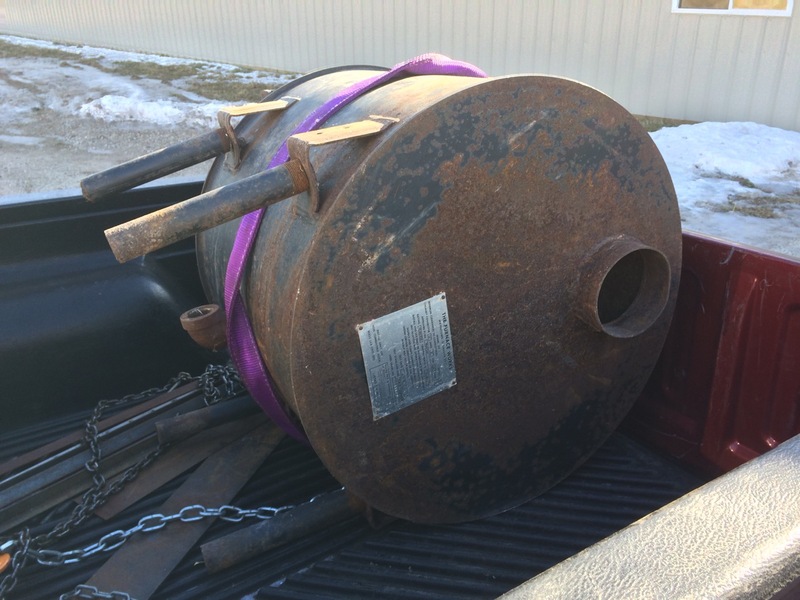 I was excited when I stumbled on an old wood boiler on Craigslist. It’s pretty plain, but not too big, and can be used indoors or out. I could install this in my back yard and run the plumbing in to the garage. Whenever I’d be working in the garage, I could fire up, feed, and stoke the boiler. I DON’T like the idea of an outdoor boiler because imperfect insulation means that heat just gets lost to atmosphere. I’d also rather not be trudging through the back yard through the cold, wet snow, and/or mud. It would also be possible to replace my existing living room wood stove with the boiler. The down-sides to that are: the boiler is not as nice looking as my stove, it’s slightly larger, and I would have to run send and return insulated plumbing lines from the house to the garage. So, that’s the garage in a nut-shell. Things will evolve a bit as the garage is built. What follows are links to my build blog as I build the garage. Here’s a link to a video playlist of YouTube videos about the garage. Demolishing the old garage: 2 Guys. 1 Day. No more garage. No internet, more chainsaws, and a concrete footer. Installing the PEX tubing. Tubing to go in the concrete to provide IN-FLOOR heat. Installing Junction Boxes and Conduit. Ben, won’t you need valves on both sides of the y-strainer in order to clean it out and not lose too much of your fluid? Hmmmm. That seems like a reasonable thing to do! I’m more or less just copying a commercially made version of the same thing. I wonder why they don’t put in shut-offs at the strainer? Looking at my setup, there are the valves to the left of the strainer for the pump and purge valve. Those could certainly be closed while cleaning out the y-strainer. To the right of the strainer, there’s no shut-offs before the boiler or until after the Temperature/Pressure relief valve at the other pump. The tubes inside the boiler are very narrow, and make a U at the top. I would be that if the valve past the T/P Relief Valve was shut off, vacuum would prevent fluid from draining back through the boiler. I would imagine that as long as I close the other various valves, that I won’t lose too much fluid when pulling the Y-Strainer. Maybe I’ll just check that once I have all this together and pressure test it. What is the brand of micro heater you were using for the garage? Also, did you calculate/figure out how much electricity it is using throughout the year? Id love to know how many panels Id need to offset my garage heat. 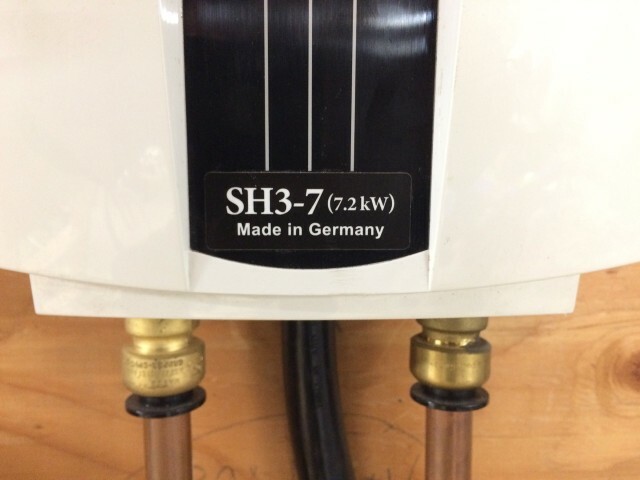 I’m using a 7.2kW Stiebel Eltron Hydro-Shark 3 model number SH3-7. Theoretically, it draws 7200 watts at full power. 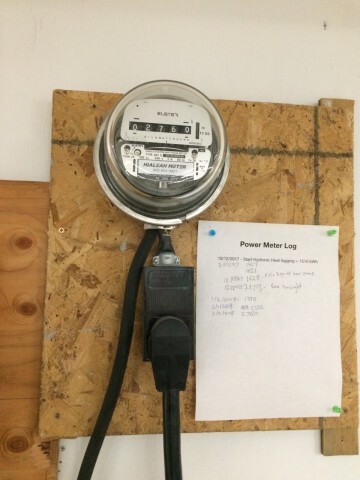 I’ve made a paper log next to that power meter to track electric usage. It looks that in the time between October 12, 2017 and March 3, 2018, I used 1250 kWh of energy, or about $162.50 worth at regular retail electric cost. 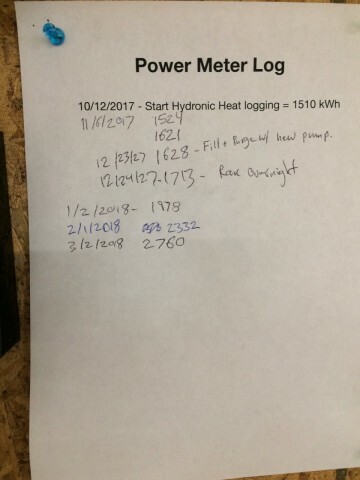 I ran a custom solar production report for that same range of dates. During that time, my solar only produced 1889 kWh of total energy. Keep in mind that I was usually just heating my garage to a low level. I typically just had the thermostat set to 40 degrees (the lowest it would go) to keep it above freezing all winter. Occasionally, I would turn the heat up higher, if I knew I was going to be working out in the garage for a three day weekend, for example. Also, solar power production is at the LOWEST during the winter, when heat is needed the most. All that said, I still like hydronic, and it opens up other options, such as heating with an outdoor wood-fired boiler. To truly find out how much it would cost to heat your space, you need to fully factor in the size of your space, how good your insulation is, the temperature outside, the temperature you would like inside, and a few other factors. Hi, how many square feet is your garage? The upstairs/loft/storage area is an additional 27’x14′, although only the middle 4′ width is full height. The rest of the ceiling matches the roof and slopes down to a 3′ tall knee-wall. Still, it’s nice to have that additional space. Ok, so your heating 1161 sq ft, or 800sq ft, and heating it all… let me know. I have 2 pumps, but I only wanted to run 1 at 860 sq ft of basement… how’s yours running? I was told to run a pump down stream of the air separator… but I was wondering about the pump on the return line. Generally, I’ve only heated the main portion of the garage. There’s a layer of attic insulation between the downstairs and the upstairs which really does keep the heat in the main area. All my calculations were based on the <800 sq ft. Overall, the heating system has worked well. 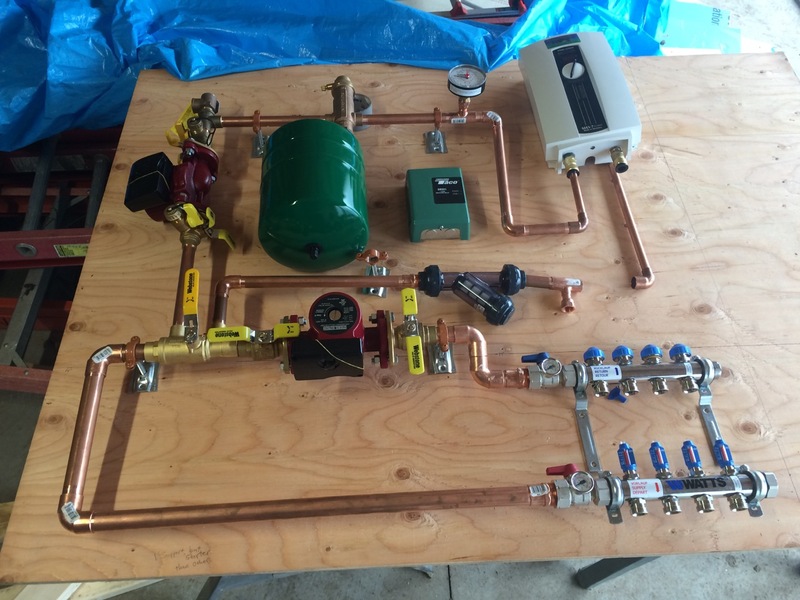 The pump set up and all related parts are an EXACT copy of a pre-built system I saw on display at a local home improvement store. Hi Ben, what is the point of the bypass system? And how did you wire the pumps to your taco controller? The bypass loop is mostly for filling and purging the system. All I really did was exactly copy a pre-built panel available at the big-box store, but saved a bunch of money by doing it myself. The Taco controller comes with directions. It’s very simple. Right inside, it’s clearly marked where to connect the power, and where to connect the pumps. There’s also a low-voltage input. The controller simply turns the pumps on and off based on whether or not the low voltage circuit is completed. I originally did that with a light switch. Flipping the light switch on turned on the Taco controller relay, which turned on 120V power to the pumps. The heater is activated by flow, so once the anti-freeze starts getting pumped through the system, the heater comes on. I later upgraded the ON/OFF only control of the light switch to an actual thermostat. I got the cheapest most basic one I could ($20) at the big box store and leave it set to the lowest setting – 40 degrees F. That way, it’s above freezing inside the garage all winter. For more on how hydronic heating works, look for the book MODERN HYDRONIC HEATING by John Siegenthaler, P.E.